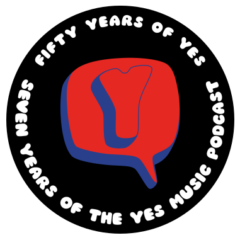 The one hundred and eighth episode of the Yes Music Podcast, featuring my thoughts on a 12 inch single of Leave It I found in a charity shop in Stratford-upon-Avon recently. As it’s half term here in the UK, this episode is recorded in my car. Apologies for the road noise – I hope it’s not too offputting! What were 12 inch singles all about? Are remixes of Yes singles a good idea? What are the three tracks on this release and are any of them worthwhile? Hi Kevin! I believe it’s Chris singing the bass vocal part! I also used to have a Yes 12″ single – I just went to look for it and it seems to be gone, so perhaps I got rid of it somewhere along the line. It was given to me as a birthday present by a fellow Yes enthusiast in December 1977. Wonderous Stories / Parallels. If I remember correctly, there was nothing special about them – no different from the album version – so it didn’t get played very often. Much less interesting than your find, but it shows that there are other Yes 12″ singles out there! On the 9012lIve concert video, you can see Chris singing the bass vocal parts, so I believe Miguel is correct. The “Leave it” dance mix is also played over the closing credits of that same concert video. That mix does not appear on the 90125 reissue, but the other two mixes of “Leave it” from this single do. A dance mix of “Owner” is on the reissue. Judging from the track list of the new Big Generator reissue that will appear in Rhino’s new box set, a dance remix of “Rhythm of Love” was also done. It seems that Atlantic spent much of the 80’s trying to get Yes into dance clubs. Great – thanks for that, Kevin. It really does make sense! A lot of that remixing 80s stuff – not just Yes – isn’t very inspiring, I find. Oh well, useful information, thanks! Previous Previous post: Wow! Charity shop Yes goodies!